In June 1989, a young man named Pete De Freitas died after his motorcycle collided with a car, as he was traveling home to Liverpool from London. Nineteen years earlier, Boston-born Alan Wilson was found dead in Topanga Canyon, California. Although he didn’t leave a note, it’s believed he died following a deliberate overdose, having attempted suicide twice before. Michigan-born and raised Dave Alexander, meanwhile, passed away in 1975, after he was admitted to hospital with pancreatitis, which subsequently led to pulmonary edema (a fluid accumulation in the lungs). Welshman Pete Ham hanged himself in 1975, and his fellow countryman, Richey James Edwards, disappeared twenty years after that, and is long since presumed dead. Though none of these five men are likely to have ever met one another, they do all have, at least, two things in common. All were musicians, and all died (or in the case of Edwards, are believed to have died) at the age of 27. With last week’s untimely passing of Amy Winehouse at the same age, much has been made of the so-called ’27 Club’, a mythical society that noone actually formed, and nobody requests to join. For the ’27 Club’ is made up of deceased musicians, who passed away at the reasonably tender age of, that’s right, 27. The aforementioned five individuals, while not household names by any stretch of the imagination, are all perhaps, second-tier ‘members’.Not quite in the executive class, with the high-rollers, such as Jim Morrison, Janis Joplin, Jimi Hendrix, Kurt Cobain and Brian Jones, but fully-fledged associates all the same. There is little doubt that Amy Winehouse, the reluctant star whose voice could melt hearts, tingle spines, bring a tear to the stoniest eye and swathe an audience in goosebumps, will hold court in business class, rather than hang with the lesser-known talents in the economy section of the mythical society. Her five Grammy Awards, three Ivor Novellos and various World Music, Vodaphone Live Music, Urban Music, Q, Meteor, MTV Europe, NME, Mojo and Mobo awards, may however, confirm her fate where her supposed ‘membership’ is concerned. Winehouse, at her best, was a formidable talent; a charismatic mountain of charm, whose throaty, authoritative vocal performances, coupled with her sultry persona, swaggering air and eclectic personality belied her humble upbringing, a childhood which kept her on the on the right side of arrogance, but once passed, led her on towards fame and the darker trappings associated with it. At her lowest, she was a pathetic addict, destroyed by drugs and ravaged by excess; yet another cliche of the ‘live fast, die young’ rock’n’roll existence. The nature of her all-round style made her impossible to categorize. She was a pop star, a media sensation, a soulful diva and could well have been a jazz icon for the ages, had her inner demons and all-conquering addictions not taken over and pillaged her weakened body and tortured mind. Beneath the swarthy take-no-prisoners facade, was the same young, often timid, occasionally ferocious woman that had made the big time, not with an army of producers, songwriters, music executives and talent show judges urging her on and rubbing their collective hands while laughing all the way to their banks, but for the most part, alone, just her songwriting ability and that voice, to keep her company. 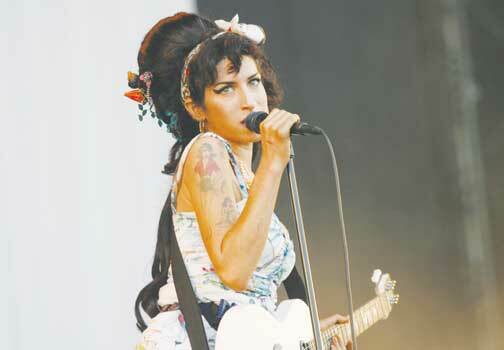 Amy Winehouse singing on the Main Stage at Oxegen in 2008 (Photocall). Hear her sing, watch her move and listen to her talk, and one could place her in any era. On any given day, she could be a Dusty or a Doris, a Janis or a Joni. She could have lived like a Diana Ross, but wound up as a Billie Holliday. She was hounded throughout her professional career, until she had little left to offer. The tough cookie persona that a section of the media had helped create, had become a simple morsel of what had once seemed destined to become one of music’s immortals. After wowing the music world with her debut offering, ‘Frank’, in 2003, when she was barely out of her teens, Winehouse went on to become a magnet for awards recognizing her stellar songwriting. In a time when so many artists’ second offerings suffer from a sophomore curse, her critically acclaimed follow-up album ‘Back to Black’, propelled her into the mainstream, and on towards international superstardom. As the A-list celebrity lifestyle beckoned however, her health, arguably both physical and mental, deteriorated, and reports of her erratic behavior began to surface. Appearing noticeably drunk, and ever thinner, at public events, added to her plummeting weight, confessions of self-harming (she once carved the name of her then boyfriend into her stomach with a shard of mirror during an interview with an American rock magazine), eating disorders, accusations of assault, and one British newspaper’s claims that she’d been photographed smoking crack cocaine, all took their toll on the singer, and she soon became known more for her offstage endeavors than for her obvious talents. It is however, the problems, thrown up by that portion of the press, that will remain in much of the public psyche, where she is concerned. Amy Winehouse, in her all-too-short career, provided us with too much to remember from a life too difficult to forget. The barstool philosopher will comment on addicts, and their place in society, completely missing the irony as he sips at his own necessity. The media darlings, the pretty girls who sing, dance, wear revealing clothes and, well, do as they’re told (even if it’s like, really naughty, just to keep in the public eye), will never hold a candle to her legacy. We’ll remember the fun times, like when she was asked into the DJ booth at a nightclub, immediately fought with the DJ, and was thrown out. The time she punched a fan for fondling her at a concert. Her haunting, tear-jerking version (possibly one of the best covers of all-time?) of ‘Will You Love Me Tomorrow’, her performance at the 2007 Mercury Awards, where, her reputation preceding her, guests were surprised to see her turn up, never mind take the stage. When she did, and eased into ‘Love Is A Losing Game’, it was one of those moments, where breaths were taken away, held onto briefly, and returned moments later accompanied with a sense of awe. The era (of Amy)-defining anthems such as ‘Back to Black’, ‘You Know I’m No Good’, ‘Rehab’ and ‘Valerie’. Amy Winehouse, in her all-too-short career, provided us with too much to remember from a life too difficult to forget. The songs and the sadness, the music and madness, if there is indeed a ’27 Club’, then Hendrix, Cobain and the gang may well have to step aside for a moment, for a lady’s just entered the room. Pete De Freitas was the drummer with English ‘alternative rock’ act, Echo and the Bunnymen. Alan Wilson was the singer with Canned Heat, perhaps best known for their hit song, ‘Going Up The Country’. Dave Alexander was the bassist with Iggy Pop and the Stooges, Pete Ham was a founding member of seminal British rock act, Badfinger, and Richey Edwards was the guitarist with Manic Street Preachers.